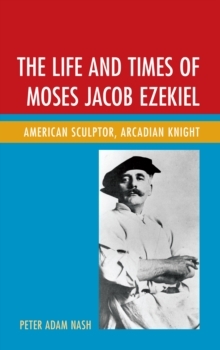 The Life and Times of Moses Jacob Ezekiel: American Sculptor, Arcadian Knight tells the remarkable story of Moses Ezekiel and his rise to international fame as an artist in late nineteenth-century Italy. Sephardic Jew, homosexual, Confederate soldier, Southern apologist, opponent of slavery, patriot, expatriate, mystic, Victorian, dandy, good Samaritan, humanist, royalist, romantic, reactionary, republican, monist, dualist, theosophist, freemason, champion of religious freedom, proto-Zionist, and proverbial Court Jew, Moses Ezekiel was a riddle of a man, a puzzle of seemingly irreconcilable parts. Knighted by three European monarchs, courted by the rich and famous, Moses Ezekiel lived the life of an aristocrat with rarely a penny to his name. Making his home in the capacious ruins of the Baths of Diocletian in Rome, he quickly distinguished himself as the consummate artist and host, winning international fame for his work and consorting with many of the lions and luminaries of the fin-de-siecle world, including Giuseppe Garibaldi, Queen Margherita, Franz Liszt, Richard Wagner, Sarah Bernhardt, Gabriele D'Annunzio, Eleonora Duse, Annie Besant, Clara Schumann, Sir Lawrence Alma-Tadema, Alphonse Daudet, Mark Twain, Emile Zola, Robert E.
Lee, Augustus Saint-Gaudens, and Isaac Mayer Wise. In a city besieged with eccentrics, he, a Southern Jewish homosexual sculptor, was outstanding, an enigma to those who knew him, a man at once stubbornly original and deeply emblematic of his times. According to Stanley Chyet in his introduction to Ezekiel's memoirs, "The contemporary European struggle between liberalism and reaction, between modernity and feudalism, between the democratic and the hierarchical is rather amply refracted in Ezekiel's account of his life in Rome." Indeed so many of the contentious cultural, political, artistic, and scientific struggles of the age converged in the figure of this adroit and prepossessing Jew.